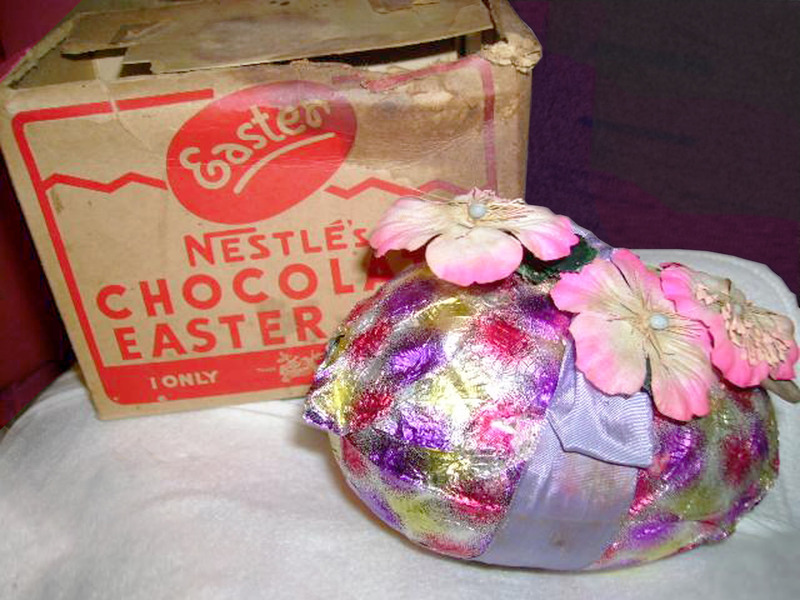 This Nestlé Easter egg was up for auction on Trade Me last year. It is 73 years old! 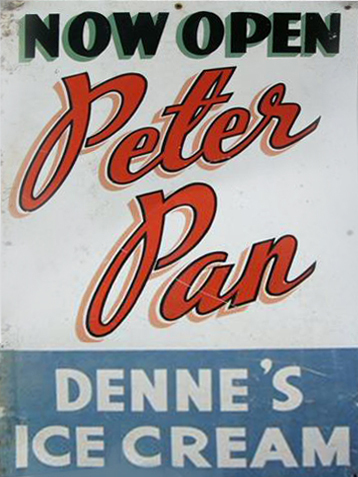 The seller, who was managing the auction on behalf of someone else, claimed that it had belonged to the owner’s mother, who, as a child was taken with the flowers on the wrapper of the confectionery, and just could not bring herself to consume it, putting it back in the box, and away in a cupboard in 1938 and there it stayed. After she passed away one of the children found it and kept it too, until last year. She certainly had more will power than I can scrape up. 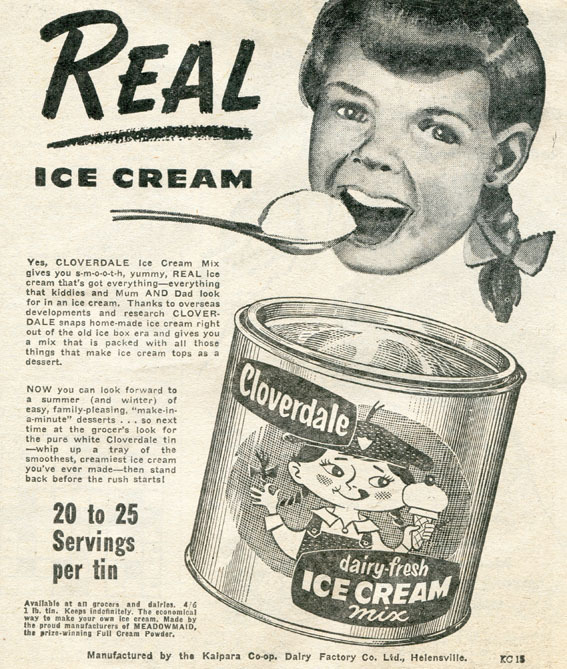 I am fascinated with things that have somehow retained their original food product – and remained in their complete packaging and appearance as they were when originally manufactured. It’s like a time capsule. I have some full jelly and custard boxes, and also occasionally vintage boxes of dummy chocolates used for window displays come up for auction, mostly in the U.S. Not so long ago there was an entire salesman’s sample tray for Brach’s candy with every treat still wrapped and intact; jubes, nougats, everything – from the early 1970’s! I even had a dream about this egg, in which I was transported back in time to a 4 Square store in the 1940s during the lead up to Easter, and there it was – sitting on a shelf! I really wanted to buy this item, but I just knew that there was no way it would ever make it to me in one piece so I let it go. Finally after a couple of months of continuous relisting, someone bought it. I still regret it, it would have been a real conversation piece to say the least! 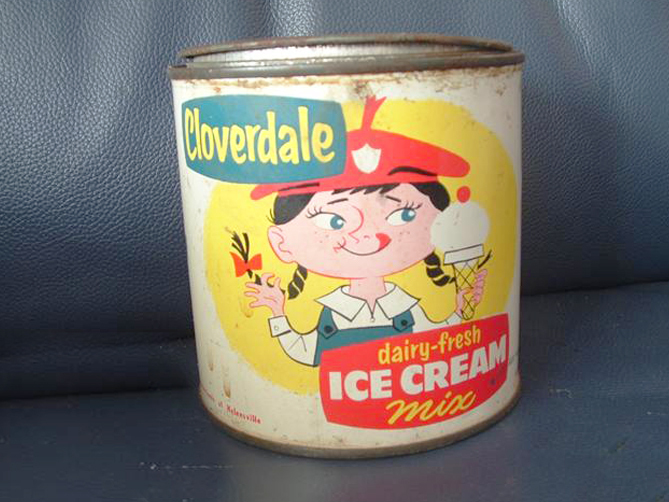 Later in the year I will do a further post on the Nestlé brand and New Zealand confectionary products from our childhood. Anyway, happy Easter to all my readers! …especially if they’re a bird. I happened across this ad on my interweb travels, hilarious and another instant Kiwi classic in my opinion, so I am sharing it here! Marketed as “the taste of New Zealand”, Kiwi bacon is very much an iconic national brand – and the factories were famous country wide for their gigantic statues of the flightless recluse perched on the rooves, a point of reference for many miles around . There was a significant smallgoods factory at 317 New North Road in the Auckland suburb of Kingsland. 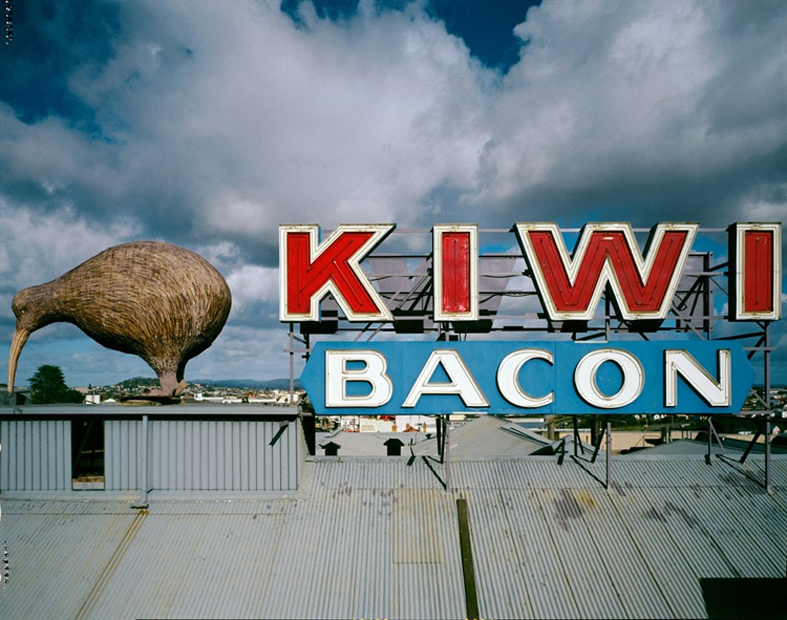 The large fibreglass Kiwi and neon sign on the roof of the building was an urban landmark dating from around 1960. There was a time that it rotated, but it had broken down many years before I can remember it in the late 1970’s. We could always see the iconic bird from my aunt’s house below and I remember it being taken away at the end of the 1980’s when the factory closed it’s doors – it was a sad day. I believe the death knell was a fire, and the building was later restored to become office for Fairfax Publications. Image © Gae Rusk, 1983. 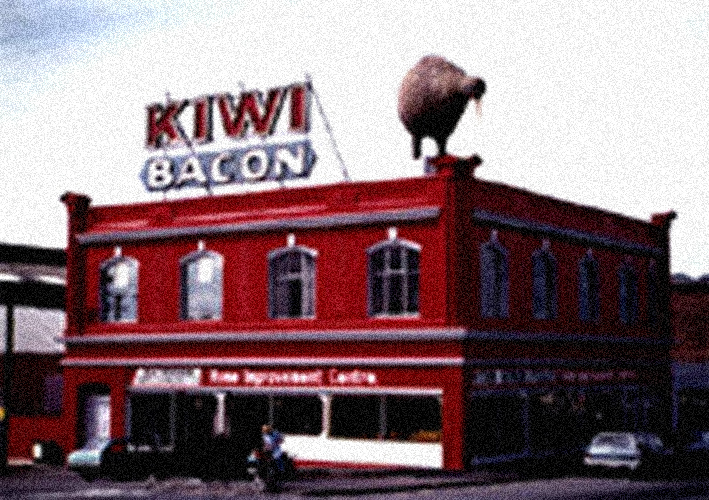 The author described this as a Kiwi Bacon Factory, in Christchurch. It’s been pointed out to me by an observant longwhitekid reader that this was not a factory, just a sign on top of a well-known building. There was a Christchurch branch and factory somewhere as evidenced by a trademark being registered by Kiwi Bacon (Christchurch) Ltd. It looks like that division made Kiwi sausages from the beginning of the sixties until perhaps some time in the nineties. I’ll look into it some more, when I revisit this brand in another future post. 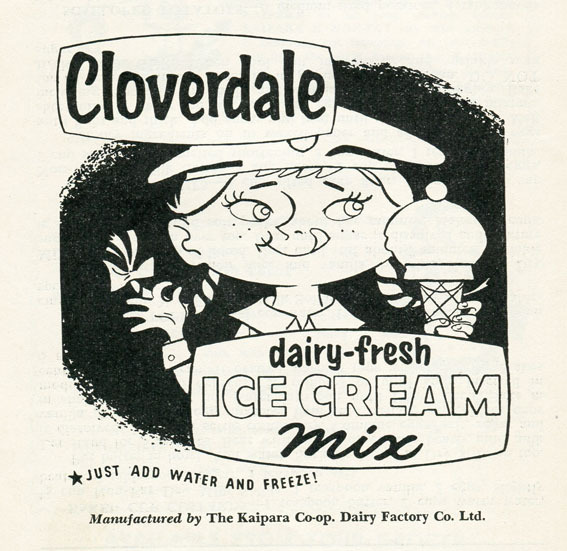 The official site states that the brand has been serving New Zealanders since 1932, but clearly before the characteristics were completely crystallized in the pantheon of Kiwiana, the company had already been in existence for some time. Kim Salamonson, the reference and archives librarian at Havelock North library, who also edits the blog for the Landmark Local History Group in Hastings, writes: ” Early in the 1900s an uncle of my grandfather’s, Mr. Martin, who owned the original Kiwi Bacon Co in Palmerston North, invited my grandfather, and his Family to emigrate to New Zealand , to eventually take over the Kiwi Bacon Co.” Milton in the South Island was also a significant factory until the early 1980’s, one of the town’s main employers along with Bruce Woollen Mills. There were probably several in locations convenient to livestock produce. 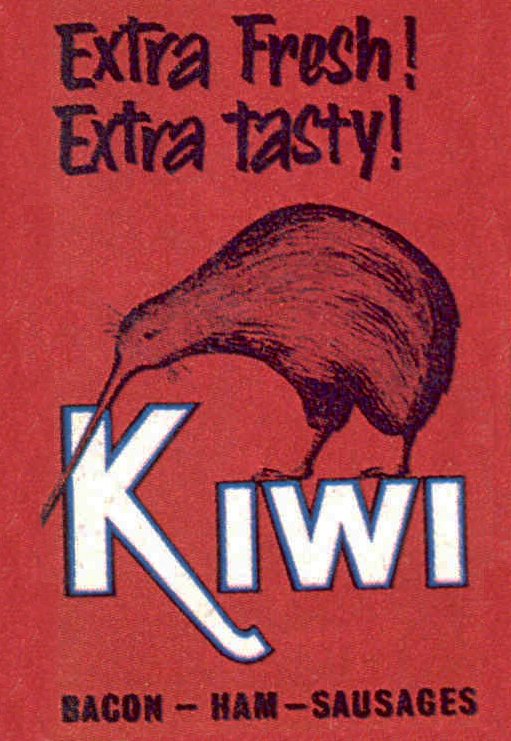 Independent for many years, as the registry at The New Zealand Intellectual Property Office attests, Kiwi is currently a division of Goodman Fielder Commercial NZ Ltd (originally famous for their cornflour, it has become over the years a brand snaffler to rival Fonterra – having at one time or another acquired Irvines, Diamond, Frosty Boy, Mainland, Wattie’s, Ernest Adams, Hansells, and Bluebird, amongst others). Kiwi Bacon playing cards were produced for decades as a promotional item and regularly come up on Trademe and Ebay albeit variations – I have a record of several different versions of the design and I will do a post devoted to them later in the year.